In the next five years, Europe is set to become the world’s largest legal cannabis market. With a population of more than double that of the United States and Canada combined, the market is ripe, and the industry has grown more in the last year than the last six combined, according to a new report. More than €500 million has been invested in the cannabis industry to date, and six countries have announced new legislation regarding the growth, sale, or consumption of cannabis. France, the UK, and Spain are reviewing current legislation, while Germany, Italy, and the Netherlands – countries considered industry leaders – are focusing on expanding existing medical programmes. The market is primed and ready for harvest – one that could be worth as much as €123 billion by 2028, say researchers at Prohibition Partners in a report titled ‘The European Cannabis Report’. Prohibition Partners was founded in 2017 with a mission to open the international cannabis industry through reliable data and intelligence. The organisation has grown to become a leading provider of market insights and consultancy, and aims to unlock the societal and commercial potential of cannabis. There is also an absence of credible research into the financial (in the form of tax revenues) and employment opportunities provided by cannabis legalisation. In the US, thanks to the rather widespread legalisation of medical marijuana, as well as recreational legalisation in 10 states, the cannabis industry is expected to outpace manufacturing job creation by 2020. In Canada, where a cannabis human resources networking platform recently launched, cannabis industry sales are projected to be higher than liquor and wine in 2019. This extraordinary growth opens a wealth of opportunity along the supply chain, “as well as ancillary products and platforms” such as smoking devices and online retail portals for both consumers and healthcare professionals, such as Zeacann, a New Zealand-based cannabis start-up currently seeking funding. 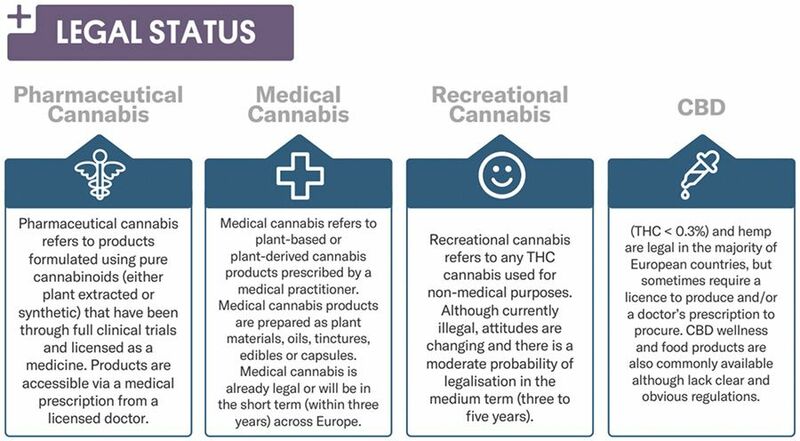 Per the report, there are four categories of cannabis: medical, pharmaceutical, recreational, and CBD. Medical refers to products prescribed by a medical practitioner for the treatment of a specific condition or disease. Pharmaceutical cannabis refers to products such as Marinol, which are produced using cannabinoids and have been through clinical trials and licensed as medicine. Recreational cannabis is any cannabis used for non-medical purposes, and typically has a higher concentration of THC – the chemical compound that provides the user a “high”. CBD products are already available in many European markets, and used for “wellness purposes” such as sleep and anxiety. They do not require a prescription and have been excluded from the report’s market sizing. For its analysis, Prohibition Partners focuses greatly on the potential of recreational and medicinal cannabis. 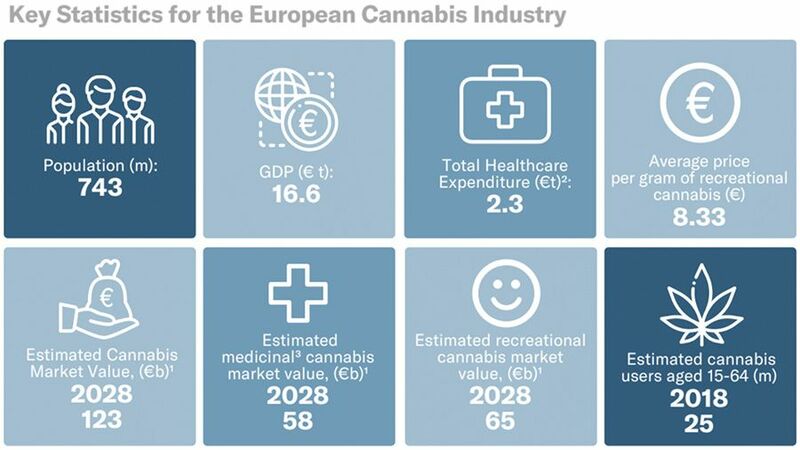 “By 2028, we estimate the European recreational cannabis market will be worth €65 billion. New products, distribution, and supply channels have further advanced cannabis consumption and presence throughout Europe over the last 10 years,” the report states. Signs of marijuana’s impending legalisation are increasingly apparent, but there are several actions that must be taken to secure a stable foundation for the industry. Some are farther along than others. After Canada’s decision to fully legalise recreational cannabis in 2018, the WHO began to review the plant’s legal status. The European Parliament Committee on the Environment, Public Health and Food Safety is working to establish a “region-wide regulatory framework on medical cannabis,” which could lead to multinational regulation in 2019. There is a need for educational programmes for medical professionals, which are not yet established. Doctors and other healthcare professionals must be knowledgeable and informed as to the benefits and uses of cannabis if it is to be properly introduced into a medical setting. European countries also must create an intra-EU cannabis trade network. “Industry leading EU nations, Germany, Italy and the Netherlands are developing tenders for domestic cultivation licenses, seeking to build a domestic industry with localised supply of medical cannabis.” Growing cannabis within the continent will mean that there will be less dependency on product imports. In other words, it’s high time to buy in. Companies are making big moves for a chance to toke up on an emerging, almost certainly lucrative market. For now, it’s a waiting game – but by the looks of things it’s going to be a relatively short one. According to a study by A.T. Kearney in the US, 76% of consumers would be open to trying legal cannabis as a therapeutic product. Meanwhile, an analysis by Deloitte found that the legal marijuana market could next year grow to $4.3 billion. Next PostIs Consolidation Key to Cannabis Industry’s Next Growth Phase?